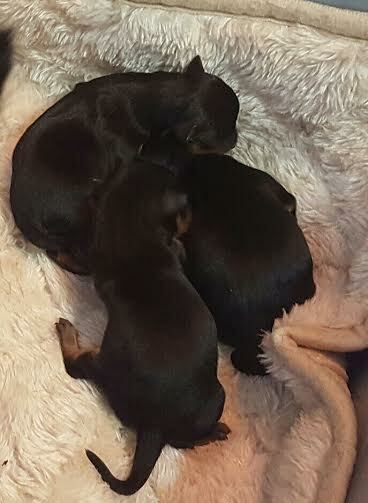 In the past seven years, Carolyn’s Precious Prague Ratters Kennel has imported 24 Czech Federation pedigreed Prague Ratters from the top breeding kennels in the Czech Republic. Due to the importance of having gene diversity, fourteen different kennels were chosen to create our strong breeding stock. One of the highest regarded breed advisors assisted in choosing the kennels and the puppies in the Czech Republic for our kennel. On our first trip to pick up puppies, we traveled over one thousand miles picking up six puppies from six different kennels in the Czech Republic. I have owned many different breeds of dogs during my life, in addition to working for vets in high school and college, and I can honestly say that Prague Ratters are the very best dogs in the world. They are playful, energetic, very loving, and extremely intelligent. Their having no health issues was very important to me having lost a beloved lab to cancer. Unlike other small breeds, they are not yappy, they love children and are most definitely not pocketbook dogs. The strict breeding practices of the Prague Ratters Czech Federation explain why Prague Ratters do not have health issues. 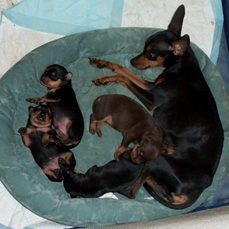 Every litter is examined by a Prague Ratter breed advisor at the age of six to eight weeks. If any defects are found, the puppy doesn’t receive a pedigree. 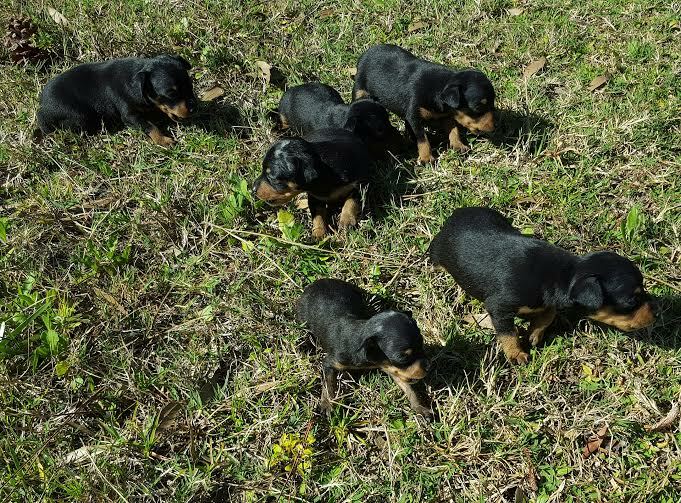 To be allowed to breed, each dog must be in two dog shows and get good ratings, and then be examined by three experts to make sure the disposition, conformation, coat, etc. is acceptable. Only then are they allowed to breed at fifteen months of age. Again, this explains how the strict breeding practices keep the Prague Ratter from having health issues. Our kennel has shipped all over the USA , to Canada, and even Albania. Many of the people that have bought our puppies have come back for another. 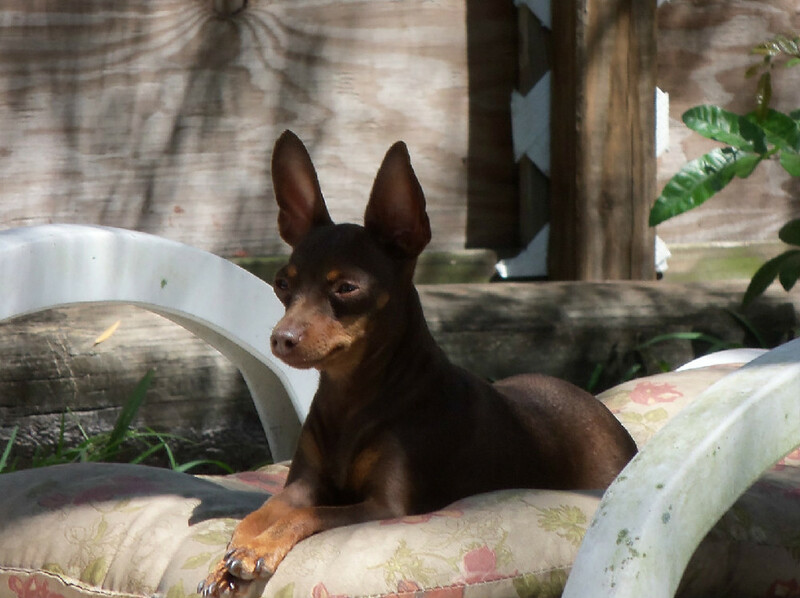 We have also sold our dogs to other Prague Ratter breeders here in the USA and Canada. Because of our wide gene diversity, we are able to provide breeding pairs. Prague Ratters are incredibly intelligent, but to help insure this, at birth I clear the airways so that oxygen is immediately available. At two weeks I put them on different surfaces because this stimulates brain development. For the same reason I give them chew toys with different textures. Having been an elementary teacher, brain development is important to me. Puppies are also socialized in a safe environment, both with our two cats, neighbors, friends and our grandchildren. The majority of my Prague Ratters are registered with the American Rare Breed Association which allows them to be shown. All of my Prague Ratters are proudly registered with the Prague Ratters Club of America. We have a lot to be thankful for all the hard work and dedication our president, Kristin Boron has given our breed. We reside in central Florida on the east coast. We can be reached by phone at 321-723-1136, or email: carolynreynolds194@gmail.com. 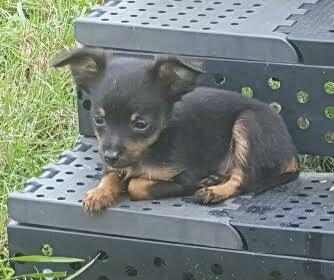 If you give yourself or your family a gift of a Prague Ratter, you will experience untold joy and love. These Pups are available! Please contact us for more info.  I have had such an amazing experience purchasing our Prague Ratter that I felt I should share it with you. I researched and learned as much as I could about different breeds and when I found the Prague Ratter, I knew I could never go with any other. We bought ours from Carolyn Reynolds and I could not say enough about how great she is to work with. Because of the distance between us, we had to have our baby flown in. I have to admit, it is scary investing in a puppy you’ve never met! But Carolyn was amazing.. She answered all of my questions, sent me pictures, and was very prompt with returning my emails and phone calls. 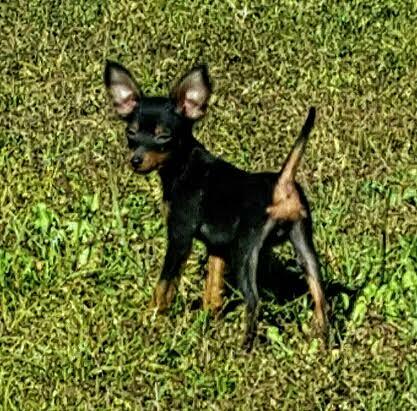 First about the Prague Ratter breed. If you are looking for a small companion dog that won't require hardly any grooming this is the best dog I know of. Carolyn says that they are the sweetest, cutest and most loving of dogs. I would agree but add that they are also great cuddlers, snugglers and bed-warmers. But make no mistake, they can be quite lively and full of energy. They are very smart and learn quickly. We got ours from Carolyn as a four month old pup and she had totally bonded with our family in less than a day. She will bark if she detects a stranger in the house but otherwise is not a yappy dog. She never barks to get what she wants. I contribute most of these characteristics to the breed but Carolyn does an excellent job of raising her pups with lots of attention and loving care which also factors in. Carolyn's dogs are not puppy mill dogs with weird personality traits. 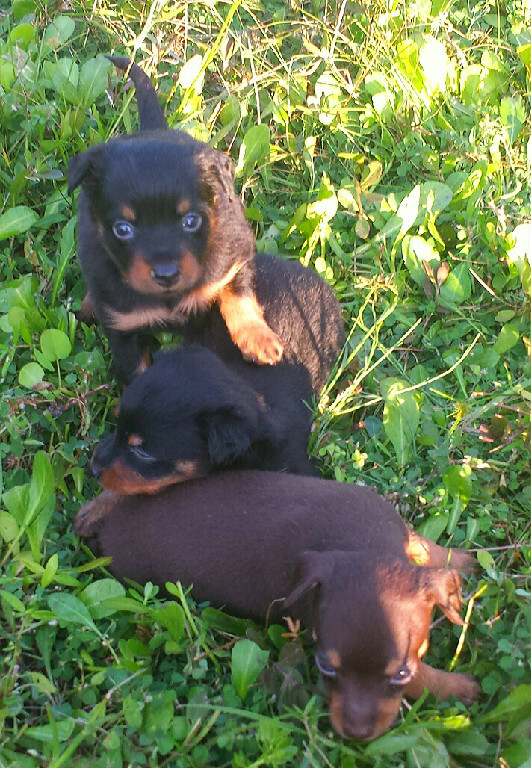 Carolyn's pups have good personalities true to the breed. She goes to a lot of trouble and expense to insure a good and diverse gene pool in her breeding program. All of her dogs are of the highest quality from a genetics stand point. Now about Carolyn Reynolds. Honest, trustworthy, full of Prague Ratter knowledge, wants to be as helpful as she can and loves her dogs (and horses). These are just a few of the positive things that come to mind. I honestly can't think of anything negative to say. If she tells you something you can take it to the bank. If you are considering one of these dogs, you should give Carolyn a call and talk it over. She is very honest and will discourage your purchase if she thinks a Prague Ratter is not right for you or your family. 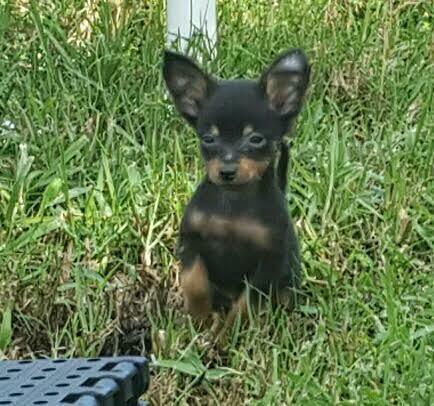 I am writing to share a testimonial about my family's experience acquiring an adorable Prague Ratter, whom we named Mojo, from Carolyn Reynolds at Carolyn's Precious Prague Ratters. We are American expats who live in Albania and we wanted to get a puppy over the summer when we came home to visit our family members. After doing some research, I came across Carolyn's contact information and, immediately after I contacted her with an inquiry regarding puppies potentially being available, she replied with answers to all of my questions. She was equally responsive to my subsequent emails and it it was an easy decision for us to choose to get a puppy from her. She sent a variety of photos and videos along the way that helped us feel that we were getting to know Mojo, even from a distance. Making the choice was only the beginning, however, and Carolyn was supportive throughout the remaining stages of the process to get her to us. To start, I made the special request that she take Mojo to be spayed by a US veterinarian because the veterinarians in Albania do not have all of the most up-to-date technologies. Carolyn had that done for us and nursed her through the recovery. Additionally, although we arrived in the US in the end of June, we could not receive Mojo until one month later due to our travels within the country. Carolyn graciously agreed to keep her with her until then. Furthermore, because we were taking Mojo to Europe, we had had to have her vaccinated for rabies within a specific window of time in order to meet EU standards and Carolyn also was sure to have that done for us at the time when it needed to be done. When the day finally came that we could receive her, things couldn't have been easier. Carolyn booked the travel from Melbourne, Florida to El Paso, Texas on Delta airlines for us. She quoted us the associated costs, secured the health certificate, provided a travel crate, and lovingly packed Mojo into it with a nice blanket, some toys, and food. I went to the Delta cargo center at the appointed time and they handed her over to me within minutes. It all couldn't have gone more easily for us and that was all due to Carolyn's knowledge and everything she did to organize the process. Now, we are all blessed to have our loving Mojo in our home. Just as the the research I did about Prague Ratters promised, she loves all four of us equally and is a joy to spend time with both cuddling and playing. If you are planning to adopt a Prague Ratter, I highly recommend that you look to Carolyn's Precious Prague Ratters to do so. Check out Bruno in his new home. He is so happy!